Surface of Ryugu photographed on October 15, 2018. Photo by AXA, University of Tokyo, Kochi University, Rikkyo University, Nagoya University, Chiba Institute of Technology, Meiji University, University of Aizu, AIST. The idea is to analyze such samples and get one step closer to understanding the origin of Earth’s water and precious minerals. According to the agency, asteroids are considered one of the candidates that brought water to our planet, which they retain as hydrated minerals. In the case of Ryugu, it is also expected to host some form of organic material. Thus, it could provide clues about the emergence of life in our solar system. 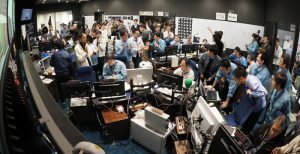 The moment of touchdown at the Japan Aerospace Exploration Agency's control room. Photo by JAXA. To collect the dust, the spacecraft fired a 5g tantalum bullet into the asteroid surface at more than 650mph. Using a long flared horn located in its underbelly and known as the Sampler Horn, the device stored the retrieved samples which will add up to 10g of dislodged debris. Hayabusa2 will attempt two other shots to collect samples later this year. One of the attempts involves using a larger missile to open a larger hole and collect below-surface matter. The landing of small rovers on the surface of Ryugu is considered a tremendous success, as previous missions were not able to do so. “Our original schedule planned for touchdown in late October of last year (2018). However, Ryugu was revealed as a boulder strewn landscape that extended across the entire surface, with no flat or wide-open regions. 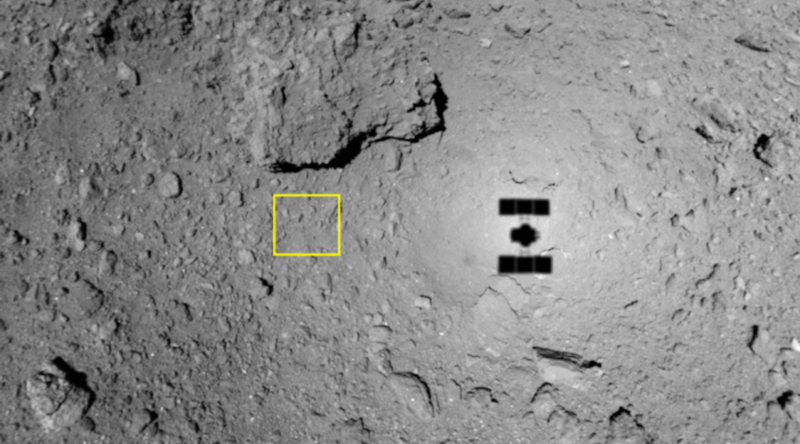 Before arriving at Ryugu, it was assumed there would be flat areas around 100 meters in size. But far than finding this, we have not even seen flat planes 30 meters across,” JAXA experts posted on the agency’s website. The craft is expected to be back on Earth, with its samples, in 2020. According to Vox Markets, successful sampling could be the first step towards asteroid mining of resources whose value -the site states- has been estimated by NASA in approximately £522 quintillion.